What is Chayla thinking? Here she is. Alone in this cavernous space, standing stiff, her gaze focused somewhere in the distance. Her forearm rests delicately on the parapet, as though she ought not be touching it at all. When the synagogue is full with worshippers, this is the wall that keeps the women from falling down to the space below, where Chayla’s brothers pray. It is the wall that holds the women in, signaling the spiritual distance that stands between them and Chayla’s father. He is the rabbi who leads the service down there. 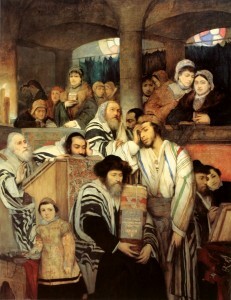 Maurycy Gottlieb’s “Jews Praying in the Synagogue on Yom Kippur” – another well known portrait depicting of mechitza and women’s section. This image has gotten a lot of press recently, as winner of the John Kobal New Work Award, one of the world’s most prestigious awards for portrait photography. The winning photographer, Laura Pannack will receive a cash prize, and her photo will be on display until February in Britain’s National Portrait Gallery. Maya Benton, who wrote about the photograph for Tablet Magazine, learned that Pannack hopes the photo will convey a “positive perception of the Jewish people and of the community.” I have no doubt that it will. The image is beautiful, as is the poised eleven-year old Chayla, who is the subject. But for us insiders – who have grown up in a synagogue like the one shown here – the photo resonates in a very different way. Like Chayla, I was once an 11-year old girl who prayed in a synagogue with a balcony. On the brink of becoming a Jewish adult, I would soon be banished from my warm seat in front of the holy ark, near my father and brother. Up above, far from the Torah, I would find a spot next to the other women. They would trickle in late to synagogue, after they finished preparing for their Shabbat guests. Catching up with friends, they would chatter while I tried to concentrate on my prayers, longing to be part of the experience unfolding in the “real” synagogue down below. Later, as a young woman in college and graduate school, I also sat in a balcony in synagogue. In those days, I was looking for love. As I watched the young men below, I abandoned my prayers. They swayed with closed eyes, connecting to the Divine, while I, up there so far away from holiness, could not help but look down and feel empty. Now, as the mother of three daughters, I still sometimes find myself in the balcony. I love my Orthodox synagogue; the community that it houses, its warm, traditional Shabbat space. But when the few seats in the women’s section downstairs fill up, and I head to the second floor, I am reminded of how far away we women are from the experience of communal prayer. I hold my daughter next to me. At 10, she is just a year shy of Chayla’s age. I wonder what she thinks about what we are doing up here, and why we are so far away from her father down below. 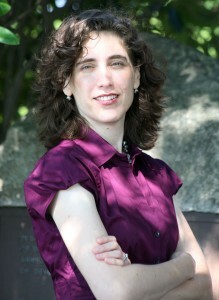 What message are we sending her about prayer and community and her place among the Jewish people? Maya Benton believes this portrait is a successful one because its subject “evinces an air of confident composure and studious equanimity, as though she knows exactly who she is.” That is not what I see. I find it so successful because of the way it captures Chayla’s complex experience (and that of so many others). It captures the effort that is exerted to maintain equanimity in a place where you so clearly do not belong. And the confusion that comes from loving your religion, your people, your traditions, your God, but knowing – so deeply – that there is no comfortable spot for you in the synagogue space. So you stand alone, looking into the distance with a disconnected gaze, wondering: If I leave here, then where shall I go? Like this post? Get the latest in MyJewishLearning’s weekly blogs newsletter. Fiddler on the Roof brought the shtetl--along with many memorable characters and unforgettable tunes--to the big screen. Vibrancy and diversity mark the new crop of novelists and story writers. On Simchat Torah, Get Up and Dance with Me!